Cannelloni are a delicious way to enjoy pasta, with the filling taking centre stage! This is my low-fat, reflux-friendly* Chicken, Spinach & Ricotta Cannelloni recipe with a Roasted Sweet Pepper sauce (as a replacement for tomatoes), which I hope you will love as much as I do! And although it’s reflux-friendly and low in fat, it’s packed with flavour and a treat for the whole family to enjoy. I do use garlic in this (and many of my recipes!) as I love the stuff and luckily it doesn’t set off my reflux, but if it is one of the ingredients that sets yours off, you can replace it with a herb of your choice or, even better, simply use some nutmeg in the ricotta mixture, to complement the nutmeg in the white sauce. To make the breadcrumb topping, simply blitz all the ingredients in a food processor until you achieve a fine consistency. A high power processor such as a Nutribullet will achieve a finer consistency, but any food processor with chopping blades will work very well. You can prepare these in advance – even the previous day, or use leftover ones from other recipes using breadcrumbs. If you are planning on adding parmesan, add this just before you use the breadcrumbs. If you haven’t already done so, prepare roasted sweet pepper sauce, but to save time, make this in advance and use it on the day. Next, finely chop the garlic, trim all visible fat off the chicken and dice it into small pieces of approximately 0.5cm. Brown the chicken and garlic (If you use herbs instead of garlic, add them at this point. If you use nutmeg, add it at the end, after you have added the ricotta – see instructions further down) with 5g of butter in a non-stick pan over a high heat, adding a sprinkling of sea salt. Cook it for 2-3 minutes, still over a high heat, so the chicken is just cooked and has released some lovely juices (these will later help flavour the ricotta). Leave to one side to cool. Bring a large pan/stockpot of water to the boil and, once it’s boiling, add the spinach (don’t worry if it doesn’t fit – push it down and you can add more as it quickly wilts as soon as it hits the boiling water). Wilt all the spinach (it will take 30 seconds to one minute max), stirring to make sure it’s wilted evenly, then drain and remove all the excess water by repeatedly pressing it with the back of a spoon in a sieve. Aim to get it as dry as possible, then transfer it to a chopping board and roughly chop it up. Add the chopped spinach to the cooling chicken and stir. Leave to cool. Pre-heat the oven to 200°C (fan-assisted). Heat 800ml of the milk with 10g of butter, add a sprinkling of sea salt and freshly-grated nutmeg (I go quite heavy on the nutmeg as this helps make the white sauce taste rich and indulgent, but if you’re not sure, go easy and then add some after the white sauce is cooked, to taste). Once the milk has reached simmering point and the butter has melted, mix the remaining milk with the cornflour and pour it into the hot milk, stirring continuously with a whisk (do not whisk it though, you don’t want frothy white sauce!). Keep stirring until the sauce has reached a thick, velvety consistency. Taste and add salt & nutmeg if required. Now stir the ricotta into the slightly cooled chicken and spinach. Check the taste and add salt if needed. If you didn’t use garlic, add nutmeg at this point. If you haven’t made the breadcrumbs in advance, now is the time to make them. Place enough roasted sweet pepper sauce into the bottom of your roasting dish to cover it to approximately 0.5cm depth (As you can see from the photos, the resulting dish will be succulent but not oozing with sauce. If you want more sauce, add more to the bottom of your dish at this assembly stage.). Fill the cannelloni tubes with the chicken, spinach and ricotta mixture, using the stem of a teaspoon to push the mixture in all the way. You need to pack each tube full of ingredients from end to end. Tip: If you have any chicken, spinach & ricotta filling left over, refrigerate it and use it the next day as a sauce for spaghetti or other pasta. Simply remove from the fridge to bring to room temperature and dilute a little with some of the pasta water once the pasta is cooking (this is done with a number of pasta sauces in Italy), then stir through the pasta. You can also add a bit more ricotta to make it go further as a pasta sauce – there is so much flavour in the mixture that it can stand a bit of dilution. Lay all the tubes over the roasted sweet pepper sauce in one even layer, then cover the whole dish with the white sauce. Sprinkle 2-3 handfuls of breadcrumbs over the top of the white sauce and spray with 1 cal spray cooking oil. Place the dish into the pre-heated oven and bake for approximately 40 minutes, checking at the end with a skewer to make sure you meet no resistance from the pasta. Leave to cool for about 10 minutes before serving. Chicken, Spinach and Ricotta Cannelloni with a Roasted Sweet Pepper Sauce | Gloriously Reflux-Friendly, Gloriously Low-Fat, Gloriously Good! 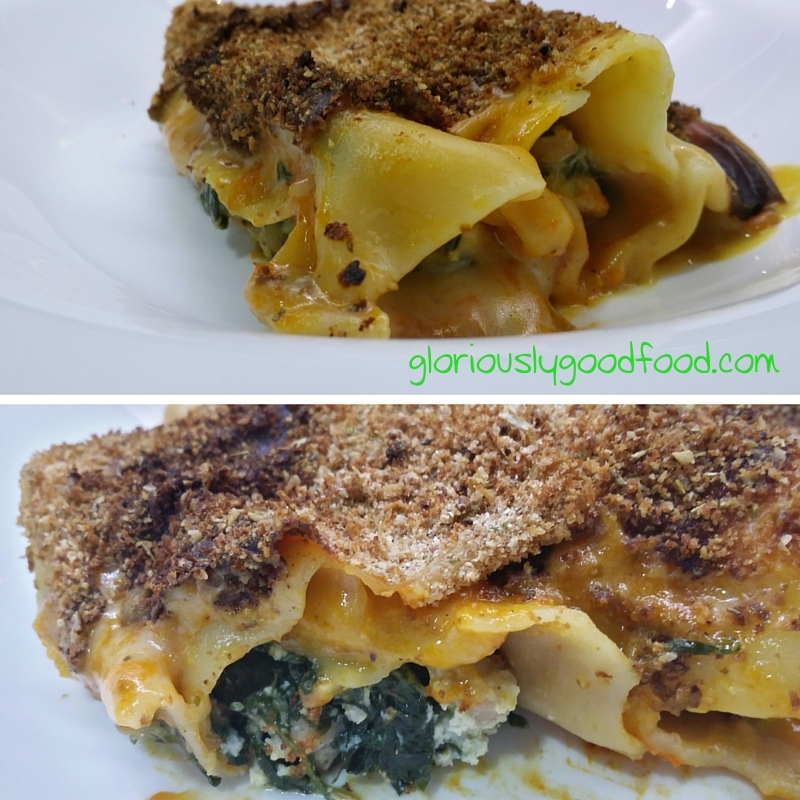 This entry was posted in Chicken, Italian, Low Fat / Low Cal, Meat & Poultry, Pasta & Rice, Reflux-friendly, Winter Warmers and tagged cannelloni, chicken spinach and ricotta cannelloni, low-fat cannelloni, reflux recipe, reflux recipes, reflux-friendly cannelloni. Bookmark the permalink.